​Some students struggle with controlling their impulses in class, and often disrupt the learning environment with inappropriate behaviors such as talking, getting out of this or her seat, or interrupting the teacher during the lesson. Distractions can interrupt the learning of other students, and coordinated behavior strategies implemented at school and in the home go a long way in preventing off-task behaviors. When a parent learns that their child is harming themselves, it can be a very emotional and confusing time. It is important for parents to regulate their emotions and react by taking these actions seriously. Self-harm is a coping skill that should only be removed once healthy coping strategies are taught and implemented. 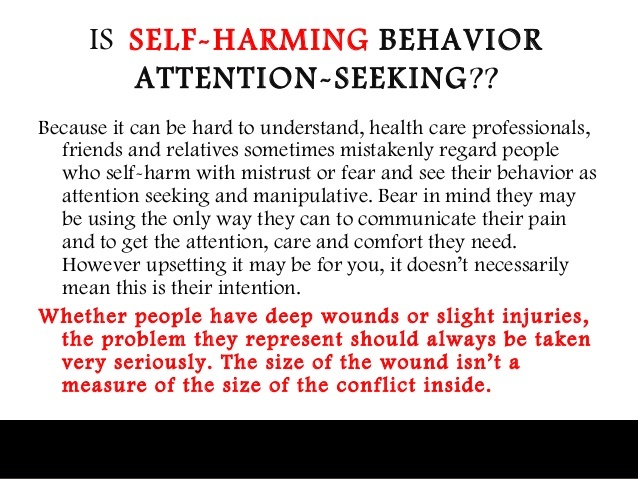 Numerous therapists in the community specialize in working with those who self-harm. To find a treatment center, click HERE. If you, or someone you know, has been thinking of suicide, help is available and recovery is possible. Start by learning the warning signs, and do whatever you can to get you, or someone you care about, the help they need. Suicide is preventable. Despite the common misconception, talking about suicide openly is one of the most helpful things you can do for a person. Bullying is unwanted, aggressive behavior, that involves a real or perceived power difference. The behavior is often repeated, or has the potential to be repeated, over time. Individuals who are bullied, and who bully others, may have lasting memories and difficulties related to their experiences. There are three types of bullying: verbal bullying, physical bullying, and social or relational bullying. For more information and resources related to bullying, see the links below. As children go through changes, whether they be in the home or at school, they can experience a sense of loss or frustration that can lead to anger if their emotions are untreated or not addressed. When dealing with youth who experience problems with anger, it is essential to realize that anger comes from pain. Below are resources that can help one understand and address anger management concerns with children. Abuse is a very serious problem that happens to our students, whether it be through violence, neglect, or sexual trauma. Counselors are mandated reporters, which means that if we hear about abuse, we must report the abuse immediately to the Department of Family and Child Services. Below are some resources if you or your child has been exposed to abuse.